It's a carnival of Australian cheese and ricotta is well and truly on the float. From The Australian Women's Weekly 10 October 1973. The 1970s open for ricotta with still more advertising from the Australian Dairy Board who are seemingly obsessed not only with making sure that we know it is “Australian Cheese. The most protein for the least money”, but also how on earth to pronounce it. Say after me everyone: ri-co-tta. Now that wasn’t so hard was it? 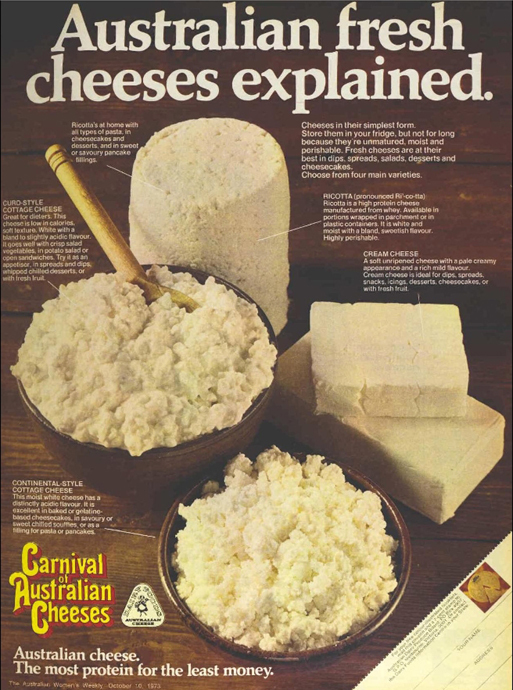 Perhaps it’s understandable that the ADB was keen for us to have a firm understanding of what ricotta was, because in the 70s and 80s, the cheese suffered from a bad case of SMD – schizophrenic media disorder – especially in The Australian Women’s Weekly. There are a number of cheeses made with skim milk, including mozzarella and a Norwegian cheese called Jarlsberg. You don’t have to stop serving lasagna, for instance; just substitute skim-milk mozzarella and leave out the ricotta cheese. We promise to keep your food interest high, your calorie intake low with these tasty and delicious Dairy ideas. Ricotta was part of the promise and the ad suggests eating ricotta as a dip or mixed in with fruits like strawberries, pears, pineapples or melons. Dairy dieting with ricotta. From The Australian Women's Weekly, 7 December 1977. Ricotta’s status as a diet friendly food seems to explode from this point onwards. If you wanted to follow the diet plan in How to be Forever Thin in 1976 you could have “1 medium size serving of ricotta or cottage cheese”. 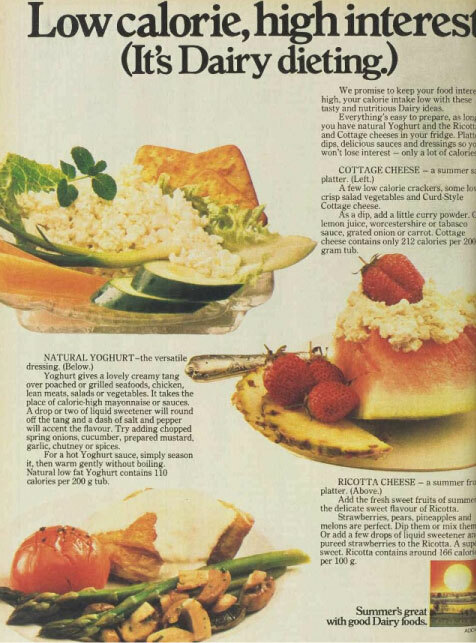 In a 1981 Weight Watchers article trumpeting foods which were “off the banned list and on the programme”, you were allowed 1/3 cup ricotta cheese with a ½ cup of grapefruit segments, a slice of toast, a teaspoon of margarine and a beverage for breakfast on Day 6. While ricotta was firmly entrenched by the early eighties as the dieter’s friend, we also see it feature in several fatty friendly forms – the ricotta cake, pastry and slice – hence the schizophrenia. In 1977, Mrs C.L Angelico of North Ringwood, Victoria won $15 for her “not too sweet” Italian ricotta cake. 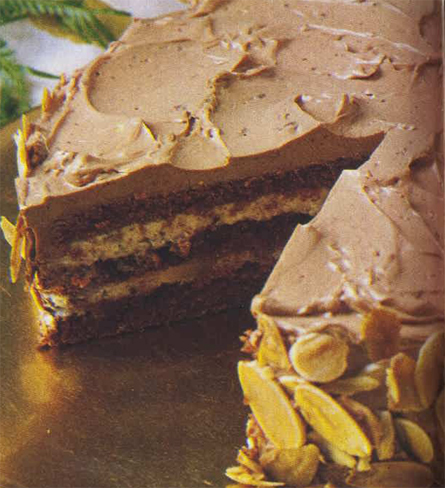 It was quite different from the 1979 Italian ricotta cake recipe in an “All Occasion Cakes” feature which called for packet chocolate cake mix and lashings of Grand Marnier. Italian ricotta cake made from a chocolate cake packet mix... just like in Italy! From The Australian Women's Weekly, 1 August 1979. There might be a part 3 in the next few weeks to bring ricotta up to the present day, but if you missed the first sizzling instalment, be sure to check out Australian ricotta – Part 1. “Australian Fresh Cheeses Explained,” The Australian Women’s Weekly, 10 October 1973, 45. Guinness, Daphne, “A Doctor’s Advice on How to Avoid a Heart Attack.” The Australian Women’s Weekly, 20 August 1975, 18-19. “Low calorie, high interest (it’s dairy dieting).” The Australian Women’s Weekly, 7 December 1977, 166. “How to be forever thin.” The Australian Women’s Weekly, 6 October 1976, 25-26. “Prize recipe.” The Australian Women’s Weekly, 15 June 1977, 87. “Prize recipe.” The Australian Women’s Weekly, 5 April 1978, page 98. “Weight Watchers Magazine Supplement.” The Australian Women’s Weekly, 10 June 1981, 2, 3, 4, 6, 7, 9, 10. ← Oh to be a fatso!